If rumours are to be believed, we’re in for a sun-filled August in Ireland. While we’re yet to see any evidence of this for ourselves, we’ve decided to keep an open mind. Sun or no sun, Ireland is one of the world’s most beautiful countries with so much to explore. From quiet paradises and winding mountain trails to dramatic cliff edges and choppy waters, we really are a lucky bunch. 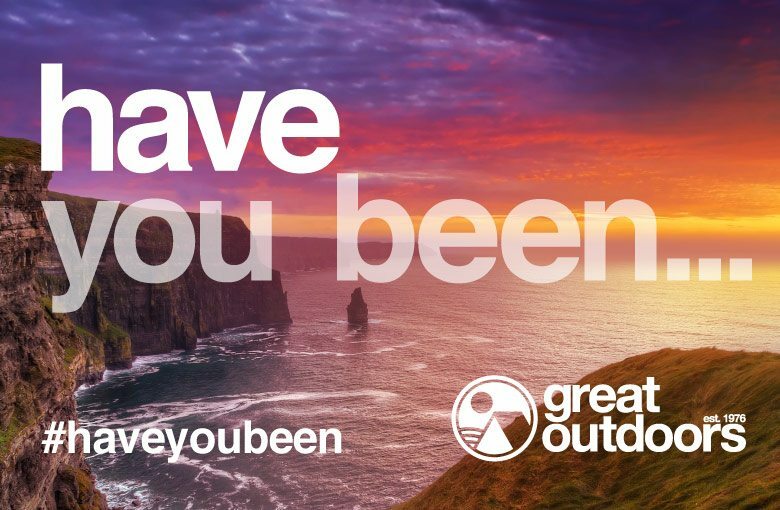 We love hearing all about your adventures; your favourite spots, Ireland’s hidden gems, where you’ve been recently to get away from it all. Your exploration gives us life. To say thank you for being you, and to celebrate all that is great and beautiful about our little green country, we are giving away four weeks’ worth of prizes. Each week across Facebook and Instagram we’ll feature an Irish destination recommended by our loyal followers and ask, HAVE YOU BEEN…? We want to hear from you. Have you been to our chosen beauty spot or is it on your bucket list? What was your experience like? What did you do, see, find? We’ll pick a winner each week and a prize will be awarded. But not just any prize. This week we’re asking HAVE YOU BEEN to the magical Cliffs of Moher? On Friday 12th August we’ll select one person at random who’ll win a stylish Vango Alpha 250 tent. How’s that for a prize? And because we love kitting out our customers so much we’ll also throw in two Atlas sleeping bags. “How do I enter?” you ask. Pop on over to our Facebook or Instagram and tell us about your travels to the Cliffs of Moher and tag who you’d fancy sharing your new tent with.